An inexperienced Fulham side began their Championship campaign poorly as they were beaten by Ipswich Town. The Cottagers, relegated last season after 13 years in the Premier League, included eight debutants in their team. Ipswich's Daryl Murphy collected Luke Hyam's pass to fire past Jesse Joronen, before David McGoldrick added a second goal with a low shot from 18 yards out. Tim Hoogland's deflected late strike gave Fulham hope of snatching a draw, but the hosts held on for the victory. It was a hugely disappointing day for Fulham, playing their first game in the second tier of English football since May 2001. Only captain Scott Parker started from Felix Magath's side that began their last Premier League match and the German boss handed a full debut to Ross McCormack. But the Scottish striker, who moved to Fulham in an £11m transfer from Leeds United, saw little of the ball, failed to create any chances and was replaced after 57 minutes. Fulham's last victory against Ipswich came on 26 December, 1963, when they won 10-1 at Craven Cottage. It remains Fulham's best win and Ipswich's joint-heaviest defeat. The London side offered little until the last 15 minutes when, trailing 2-0, they brought on England Under-17 striker Patrick Roberts. He produced a lively cameo, taking on and beating his opponent regularly, before playing a part in Hoogland's goal, although the defender's strike needed a deflection off Tommy Smith to take the ball past Dean Gerken. 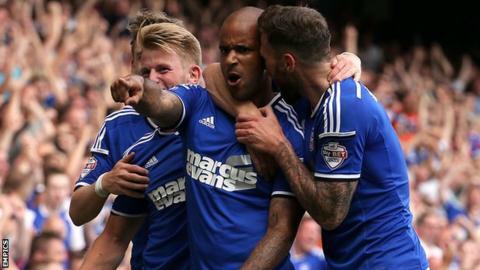 Despite some late pressure, Mick McCarthy's Ipswich side, who finished four points adrift of the play-offs in 2013-14, claimed the three points. They had made a bright start as Christophe Berra had a header tipped over by Joronen and Cole Skuse twice fired narrowly off target. However, Moussa Dembele should have put Fulham ahead when Gerken fumbled Chris David's shot, but the Ipswich goalkeeper managed to recover to block the follow-up attempt. That miss proved crucial as Ipswich took a 32nd-minute lead. Ex-England international Parker lost possession to Hyam and he released Murphy, who outpaced Shaun Hutchinson and finished past Joronen to put Town in front. Ipswich doubled their lead after 61 minutes when Murphy's low cross fell to substitute McGoldrick and the forward, making his first appearance since February after a knee injury, scored his side's second. That proved to be the decisive goal as the Suffolk side began their 13th successive season in English football's second tier with a win. "It was a nervy end but I thought we deserved the win overall. Gerks (goakeeper Dean Gerken) has not had much to do and, while we didn't have a lot of the ball in the first half, we scored a good opener on the break. "We are a better team with David McGoldrick in it. The fact he is now back is all down to his diligence and professionalism to get himself fit. "He has worked really hard and was desperate to get back playing - and it was lovely to have him back." "A lot of our young players are just out of the academy and they are not used to being tackled in that way. Match ends, Ipswich Town 2, Fulham 1. Second Half ends, Ipswich Town 2, Fulham 1. Attempt missed. Moussa Dembele (Fulham) header from the centre of the box is too high. Assisted by Thomas Eisfeld with a cross following a corner. Attempt blocked. Tim Hoogland (Fulham) header from the centre of the box is blocked. Assisted by Thomas Eisfeld with a cross. Attempt blocked. Patrick Roberts (Fulham) left footed shot from the centre of the box is blocked. Assisted by Cauley Woodrow. Attempt missed. Patrick Roberts (Fulham) right footed shot from outside the box misses to the left. Assisted by Thomas Eisfeld. Goal! Ipswich Town 2, Fulham 1. Tim Hoogland (Fulham) left footed shot from the right side of the box to the bottom right corner. Assisted by Patrick Roberts. Attempt saved. David McGoldrick (Ipswich Town) right footed shot from a difficult angle and long range on the left is saved in the bottom right corner. Assisted by Anthony Wordsworth. Attempt blocked. Cauley Woodrow (Fulham) header from very close range is blocked. Assisted by Konstantinos Stafylidis with a cross. Substitution, Ipswich Town. Kevin Bru replaces Luke Hyam because of an injury. Delay in match Luke Hyam (Ipswich Town) because of an injury. Tyrone Mings (Ipswich Town) is shown the yellow card for a bad foul. Attempt missed. Anthony Wordsworth (Ipswich Town) header from the centre of the box is too high. Assisted by Luke Chambers with a cross. Attempt missed. Moussa Dembele (Fulham) left footed shot from outside the box is high and wide to the left. Assisted by Tim Hoogland. Offside, Ipswich Town. Anthony Wordsworth tries a through ball, but Daryl Murphy is caught offside. Substitution, Fulham. Patrick Roberts replaces Shaun Hutchinson. Tim Hoogland (Fulham) wins a free kick in the defensive half. Corner, Ipswich Town. Conceded by Konstantinos Stafylidis. Substitution, Ipswich Town. Anthony Wordsworth replaces Cole Skuse. Attempt saved. Jay Tabb (Ipswich Town) header from the left side of the box is saved in the top centre of the goal. Corner, Ipswich Town. Conceded by Jesse Joronen.